Love is … your world turned upside down. To let you soar into new heights together. credit: as tagged and @angelangie's tumbler. kekeke. 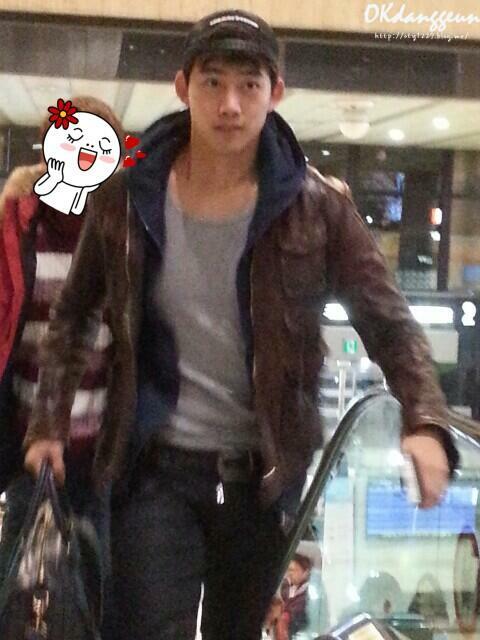 background: this was posted on feb 2 with caption "meow meow meow"
2PM at Gimpo Airport, arriving from Japan. Have you ever seen the movie in a row? 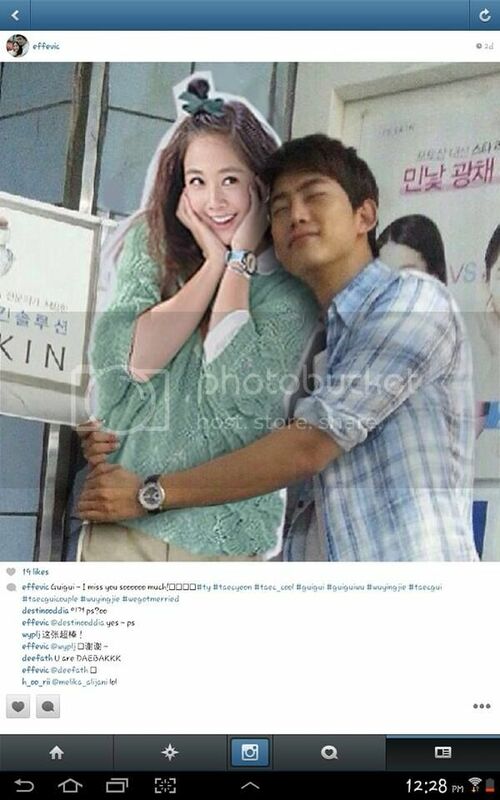 chatter: is okcat keeping an eye? Guigui posted on her FB Sat, February 1, 2014; 9:23 AM. 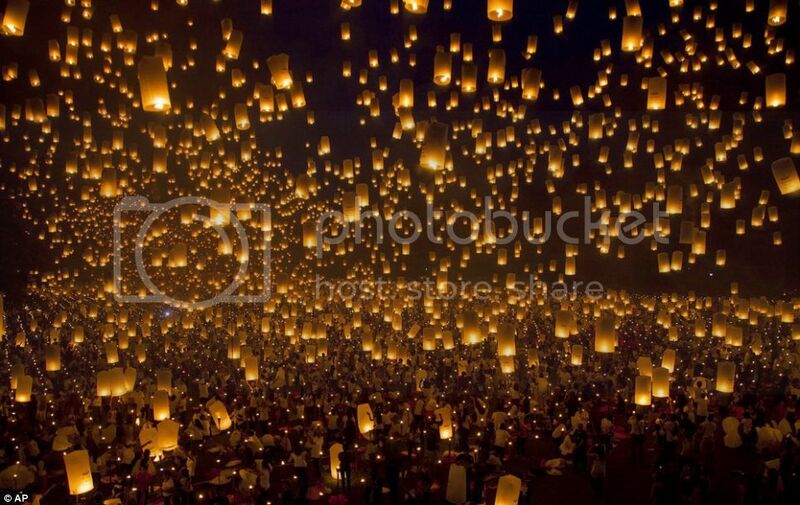 I just trawled (not trolled, okay) the 2pm thread here in soompi and a poster there, named im cun, posted this picture of confetti(?). I guess these are the silver tapes that @bibidep mentioned here from a fan account post. Thank you Im_cun. fan report ~ do not call me oppa! Apparently, TY told fans at Arena Tour Yokohama, not to call him Oppa! gif jdvd: GuiGui's interview - unseen cut, Part 2.
question: whom do you like more? gif jdvd - GuiGui's interview - unseen cut, Part 1.
question: whom do you like to see most? 2PM - When asked who wishes to get married now, Taec put up his hand. Other members of the group were taken by surprise. The look on ChanSung's face is 'priceless'! The frightened look and the disgusted look of the 2 wives. @bluemoonlight Triplet, are you going for a vacation somewhere? Have a great time, where ever you're going to! I've made some gifs of your WooYoungie in WGM, he's such a gentleman like his hyung, Taec. Both their wives said they are manly/masculine. Taec for chopping a chicken and WooYoung for making a hole thru thick ice. 2PM boys are really good husband material! I've too much free time today, I've made some gifs on Genesis of 2PM's promo in Japan to pass time. Their promo is really huge ... even OkCat is spotted there .... Hmmmm ..... can we spot that special someone perhaps? @korchick, Care to add an explanation of woojuju and other weird cooing sounds from Korean lover boys? Background: As you might be aware, we are studying 'migration and courtship patterns among the micheseo family of birds'. We have focused our study on a pair of birds who we have collared and are following through electronic signals. The female is tagged 'GHOST163', or 'GuiGui' for short and the male is tagged 'OKCAT185', or 'Taec' for short. Current Status: GuiGui has flown from the northern hemisphere back to Asia. It was confirmed early this morning (Jan 31, 2014) that she left the Los Angeles vicinity for Asian shores. Taec is meanwhile with his flock, (who we refer to as the afternoon boys), in Yokohoma Japan. Given the season of the horse has just begun, it appears to be tad unusual for GuiGui to start her flight back to Asia today. The final destination for GuiGui has not been confirmed but we assume that it is Taiwan. However, given that Taec is in Japan, there is some conjecture that the lady bird might be heading for Japanese shores. There is no evidence to conclusively decide either idea. We are currently waiting for satellite to send us their exact geographic location. Request: If any birdwatcher catches sight or has information regarding the location of these two birds, please do let us know. If they are both in Japan, please let us know immediately! I love this scene, too, @BiruAngel. Thanks for doing them. Love is…when your inner child finally finds your true companion. HE got upset too when GG described another guy as "very tall and moshita" and said it wasn't HIM. But our Guigui quickly consoled him with a hug after he whined, and she realized that she had hurt his feelings with her faux-pas. Taec's Twitter on Fri, Jan 31 at 11.06am (12.06pm in Tokyo). from twitter: 주인님들! 주인님들! 즐거운 설 연휴 보내시라냥!^-^ 맛있는 음식도 많이많이 드시라능!! 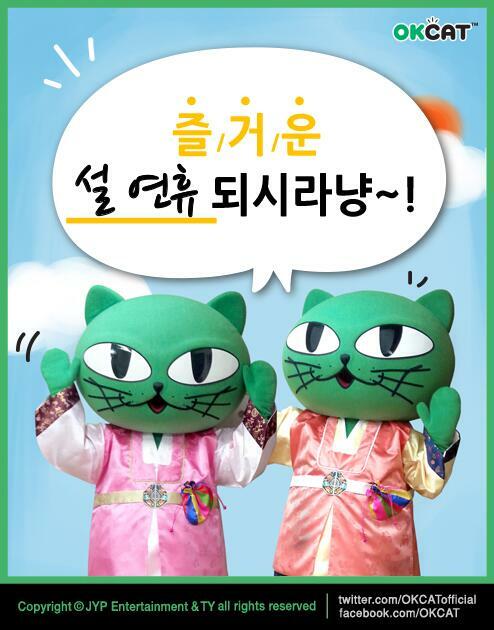 this was posted yesterday (jan 30) on okcat fb with english caption: Happy Lunar New Year's Day-! Meow-! Jan 28 ~ happy that it is 6 o'clock! caption: (in english) Watching '2PM HANDS UP ASIA TOUR' DVD-! chatter: where is she off to? 2: gif: which picture do you like? Hmmmmmm sending a subliminal message? 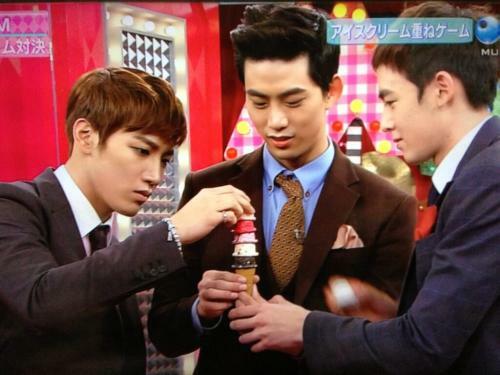 2PM playing an ice cream game on the Japanese show, "Music Japan"
Taec left for Japan again, this time to Yokohama (Arena Tour). Nickhun and WooYoung read out the fortunes for the band. chatter: what kind of fortune is Taec's? 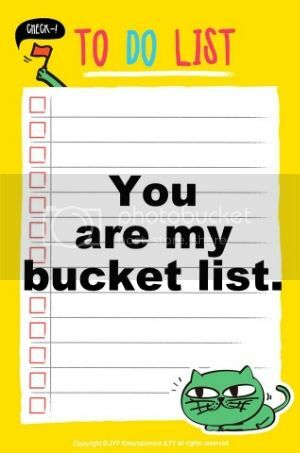 Okay, it's time for the @leechalee Mushy Memo Challenge. I think I owe you two. New OKCat Cartoon set, post on Jan. 29, 2014 at 11:55am Korea time. OKCat try to take the train to go some where hahaha. Let's just hope she is by his side. Connect the dots: ready to go? 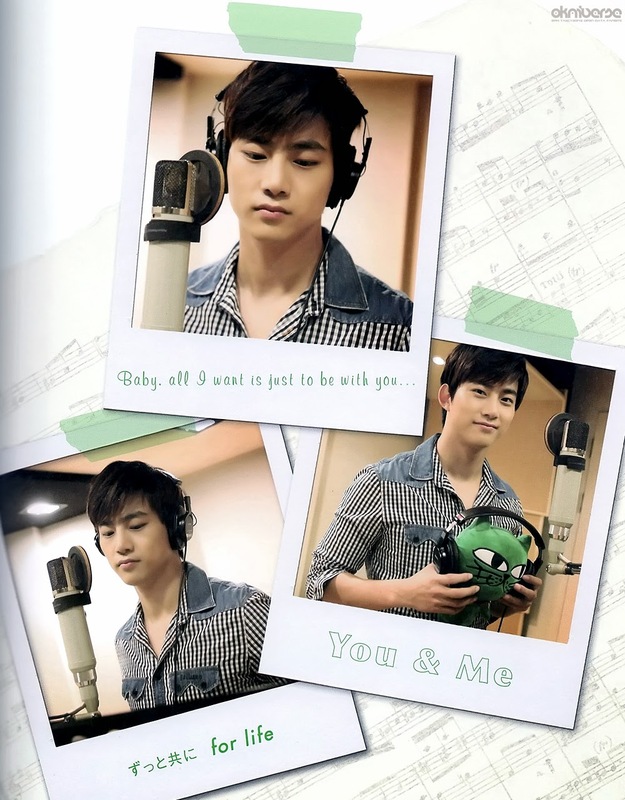 Jan 14: Okcat "always behind you"
Jan 27 ~ "just do it"
chatter: what does the pose remind you of? lake shoot? 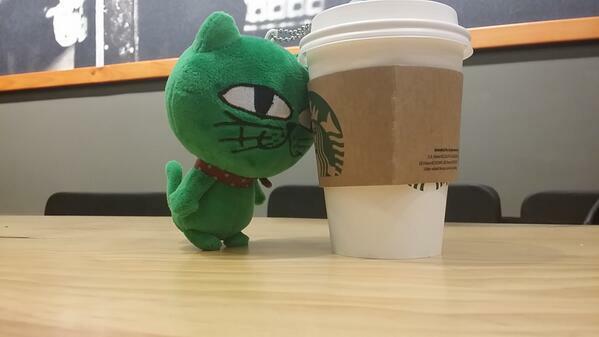 what does Okcat asking for? Caption : 마시고 말테다냥! 냐냥! Caption : JUST DO IT-! MEOW-! chatter: when was this taken?